This is the summary of consumer reviews for Garmin Forerunner 210 GPS-Enabled Sport Watch with Heart Rate Monitor and Foot Pod. The BoolPool rating for this product is Good, with 3.70 stars, and the price range is $199-$299. Garmin Forerunner 210 gives you the freedom to train indoors or out, while tracking every minute and every mile. This sleek and simple, GPS-enabled sports watch accurately records how far, how fast and how hard you worked. Forerunner 210 is easy to setup and simple to use. The display is easy to see and read. It lets you create customized interval sessions and see your pace for each interval. Forerunner 210 features HotFix® satellite prediction, which means it locks onto satellites quickly so you can be out the door and on with your run in no time. It also has a high-sensitivity GPS receiver to stay locked onto satellites, even near tall buildings or under tree cover. Forerunner 210 is available with or without premium soft strap heart rate monitor to display heart rate in beats per minute. It has 5 heart rate zones, which can be customized based on your exact zones. It also provides heart rate-based calorie computations so you can more accurately track your calories burned. This GPS watch can also be used with foot pod. Using advanced accelerometer technology, the foot pod collects and sends precise data about your movements, gathering distance and speed data that is 90% accurate for most users. Tracking your data is simple with Garmin ConnectTM for free data analysis and sharing. In some cases, the watch stopped working at time and some users had problem while charging this watch. Forerunner 210 seems to have less resistance to water as some users reported that watch stopped working after they took it in shower. Overall, Garmin Forerunner 210 is a user-friendly GPS watch that gives many ways to track performance to help you reach your fitness goals. Works with Foot pod as well. If you're looking for a great looking, light weight GPS watch to track time and distance, without all of the bells and whistles, you've found it here. Has helped my training, works well and a great company to their customers. The GPS takes an age to find satellites - but when it does it works well. My pace was easy to track and the mileage seemed to be very accurate. The charging system is different than I've seen but works well. Acquiring satellites for the first time took less than 30 seconds. Simple design, easy to see screen, with real buttons vs the newer touch models that go haywire when you sweat. GPS watch works as advertised. First one stopped working after short shower killed it. The heart rate monitor failed to work after two weeks. That worked a few times for a day or so...but now the so-called fix no longer works. While this's a great product and when it works, it works great. Decent system, when it works. I returned this item as it stopped working after the first use. The Battery died and it never worked again. For the first time after almost 2 years I simply can't get it to work. Used current pace and cumulative pace and like current pace better. For me, this's elapsed time, elapsed distance, average pace of the run, and current pace. Actually one of my favorite settings is the option to change the pace display from lap pace, average pace or current pace. "Lap pace" is preferable to "current pace" because the "lap pace" data is more smoothed out, "current pace" can bounce around quite a bit and isn't really useful. The tracking display of the watch shows the current time, distance, and pace. Additionally, I've it display "lap pace" which is an average of my pace for the current lap (mile). Knowing my current pace is important to me, and the 210 allows you to choose between having instant pace, average pace, or lap pace while you run. However, you can display current pace, distance, hear rate etc.. 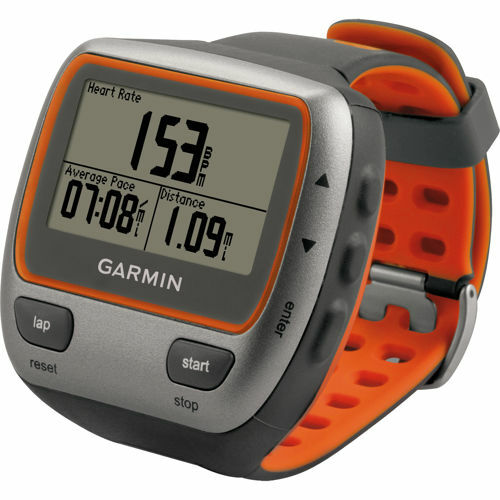 It gives great feedback on pace, time, distance at a glance. You can upload data to Garmin Connect, and see graphs of heart rate, speed, elevation, a map of the GPS track. The GPS locks faster, it's lighter weight and displays local time (I assume it gets it from the GPS satellites). It's a perfect GPS watch. You can also export that GPS data to a number of formats, including GPX and Google Earth. 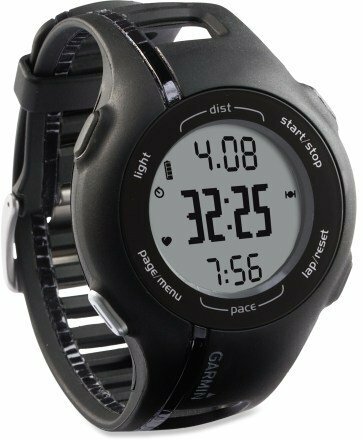 No issues, small, nice looking as a watch, hooks to satallites great and quickly, shows current pace, offers easy set up interval training, uploading runs is a breeze, band is comfortable and fits well. The GPS seems to be fairly accurate, even in my older, heavily-forested neighborhood. Garmin has really improved their GPS enabled sports watches, comparing the 210 to the older models. It's easy to set, easy to set up, easy to get a GPS signal, easy to sync with the HR monitor, and easy to upload to strava or your data collection place of choice. The watch is easy to use. They're very easy to use! The pins are extremely easy to line up. I like the watch, seems fairly easy to use. Easy to log workouts on Garminconnect.com, good charts and map overlays. This item was so easy to use. It's pretty easy to work, tho I've have had to review the manual a few times. This a excellent choice for beginners and not so beginners is really easy to use ... it provide all that you need and more. I read some complaints about charging the battery, but I've had absolutely no problem with connecting it to the charger. First time, I apparently jarred them ever so slightly and my watch didn't charge. Some complained about the clip to charge it, and I don't think its too much hassle to get it connected, but then this's our first watch you've to charge! But, I've never had any problem charging it and the battery life to me, seems good. When you charge this watch, you do need to make sure the prongs are connected correctly and wait until you see the battery symbol to know it's charging. I've had no problems with charging/downloading from the 210. Mine didn't last over 3 months and it stopped charging. I ran for 3 1/2 hours when the battery was displaying only half charge.